A quick background on the festival; Every year Epcot hosts the Flower & Garden Festival, this year sponsored by HGTV. The festival involves elaborate gardens, colorful flowers, booths with information on gardening, sales of plants and gardening supplies, and shows revolving around the gardening subject. This is spread all throughout Epcot’s World Showcase. 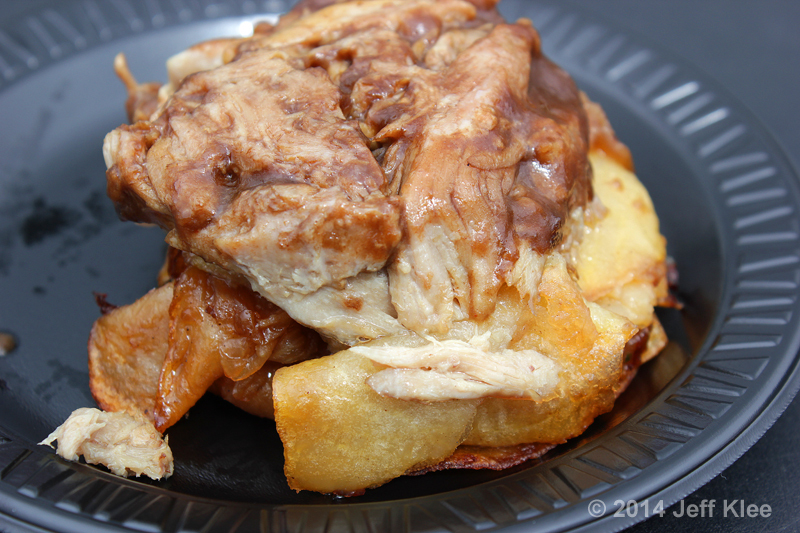 Last year they introduced the food kiosks to build off the success of the Food & Wine Festival that’s held in the Fall. 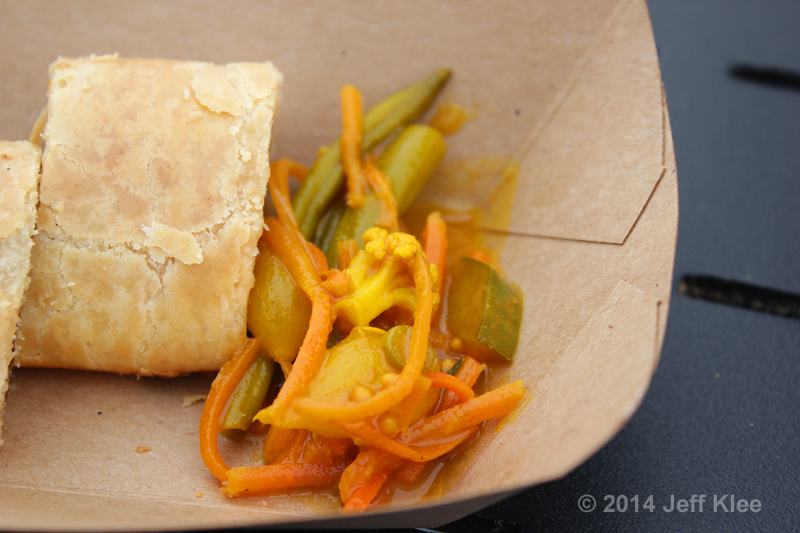 The kiosks have foods related to the World Showcase country in which they’re situated. They are served in small, square, paper bowls and most cost between $4-6. Because these foods are only around for a limited time, and most of you probably won’t make it down there to try them, I’ll keep the information somewhat brief. There is a lot of food to cover, and the info here can be a guide for future visits. It helped me this year as a reminder to what items were repeated from last year, which foods were new, and what my opinion was on the repeats. It turns out my previous opinion is apparently irrelevant as I decided to try everything again this year anyway. The first stop was the Pineapple Promenade. I have never liked the flavor of pineapple, so normally I’d skip this kiosk all together. They carried three versions of the famous pineapple Dole Whip®: plain, with Myers’s® Dark Rum, and with Parrot Bay® Coconut Rum. I recently tried Dole Whip® and found it be exactly what I expected, pineapple flavored soft serve. I therefore had no interest in these three versions of the popular Disney treat. There was a fourth item however, that caught my attention. 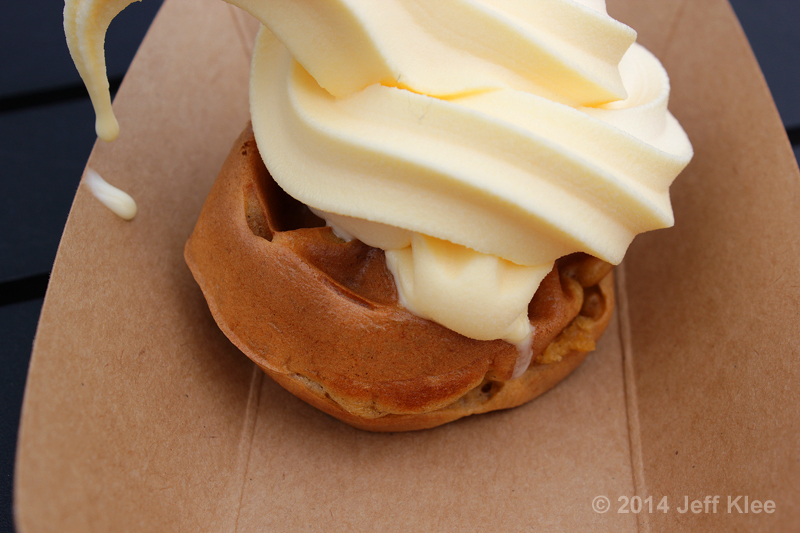 A Sweet Potato Cinnamon Waffle with Pineapple Dole Whip®. Overall I wasn’t too impressed with this dish. The waffle tasted mostly like a plain waffle, but I did notice the hint of sweet potato and cinnamon flavor. My biggest problem was the Dole Whip®. 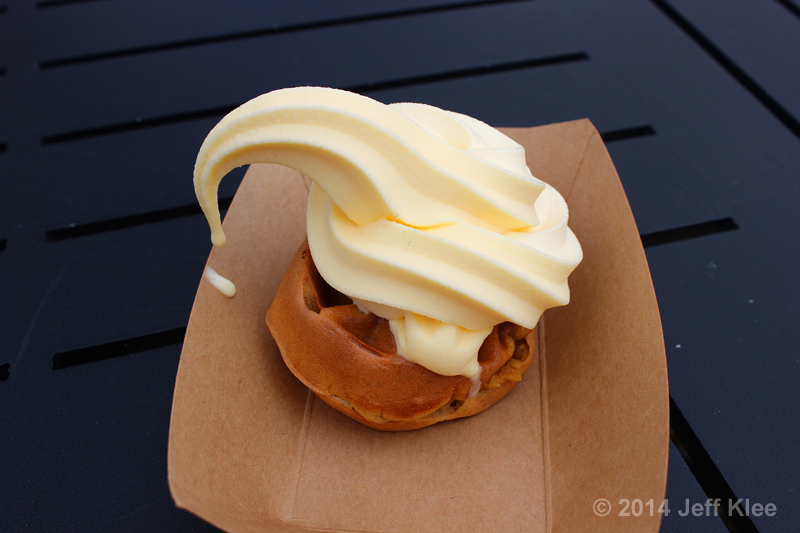 When the waffle and soft serve were eaten together, the pineapple completely overpowered the waffle flavors. I had to separate the two in order to find out what the waffle tasted like. Since I don’t really like pineapple, the combination of the two didn’t work for me as all I could taste was the part I disliked. If the waffle had a stronger taste of sweet potato and cinnamon, or there had been more waffle versus soft serve, it may have allowed me to overcome the overpowering pineapple flavor and I may have enjoyed it quite a bit more. Next, we walked over to the U.K. Pavilion and stopped at Buttercup Cottage. This booth had four items to try. 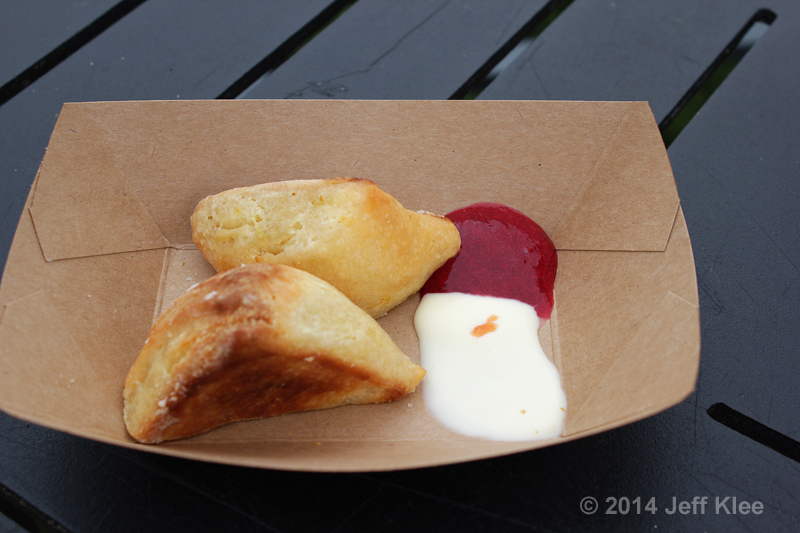 The scones reminded me of typical Southern style butter biscuits, only a little crunchier. 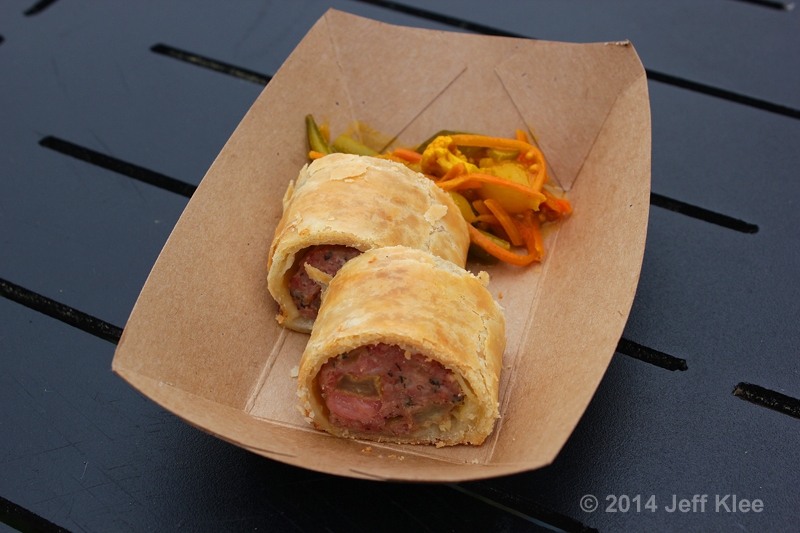 I then started on the two sections of a Pork and Apple Sausage Roll with a side of house-made Piccalilli. 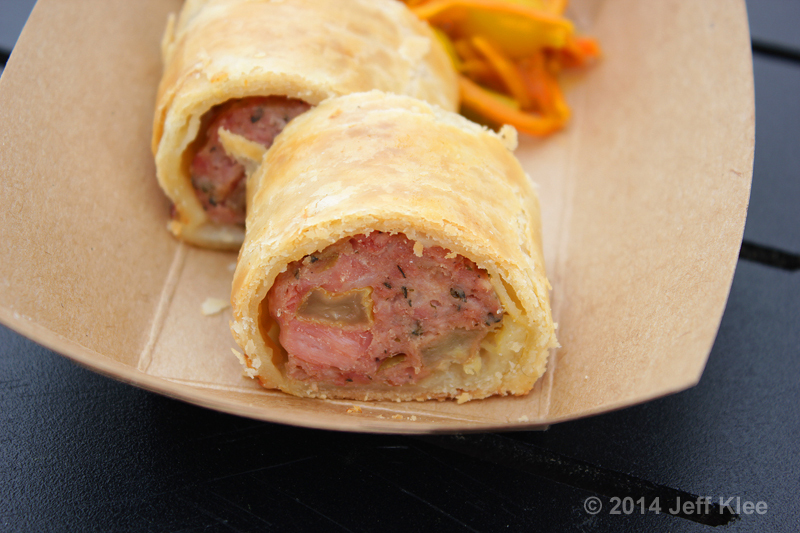 The sausage is rolled in a phyllo dough, and I love this type of pastry breading. The meat was not as salty as I would have expected from a typical sausage. I thought it was very much like an unsalted pork sausage, although I could certainly taste the hint of apple. While I wasn’t getting the sweet and salty contrast due to the lack of salt, it was still a good flavor combination. The side was picalilli, which in Britain is a mix of vegetables that have essentially been made into a sort of sweet relish. This one appeared to contain green beans, cauliflower, carrot, and cucumber among a few others. Picalilli is commonly seasoned with mustard and turmeric, which is what gives it the yellow color. My initial thought was that it tasted just like sweet pickles, only with a slightly different texture from the various vegetables. I liked it, as I enjoy pickles. 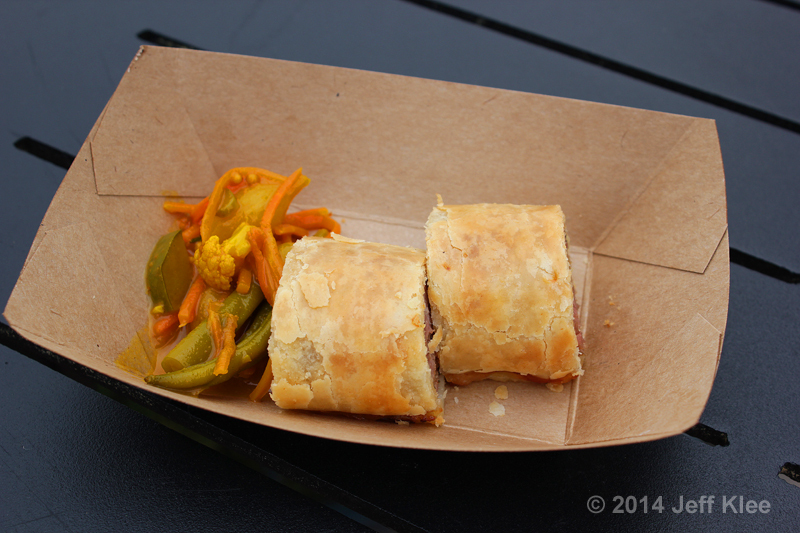 Picalilli is a common accompaniment to meats, especially sausage, so it was the perfect fit to the sausage rolls sitting next to it. It starts with their specially made bun. It was warmed when I received it, but by the time I got around to eating it, it had almost cooled completely. I’m sure the warm bun against the cold tartare would have been excellent. The biscuit had a good flavor, appeared fresh, and as a bonus it had large salt crystals embedded on the outer surface. 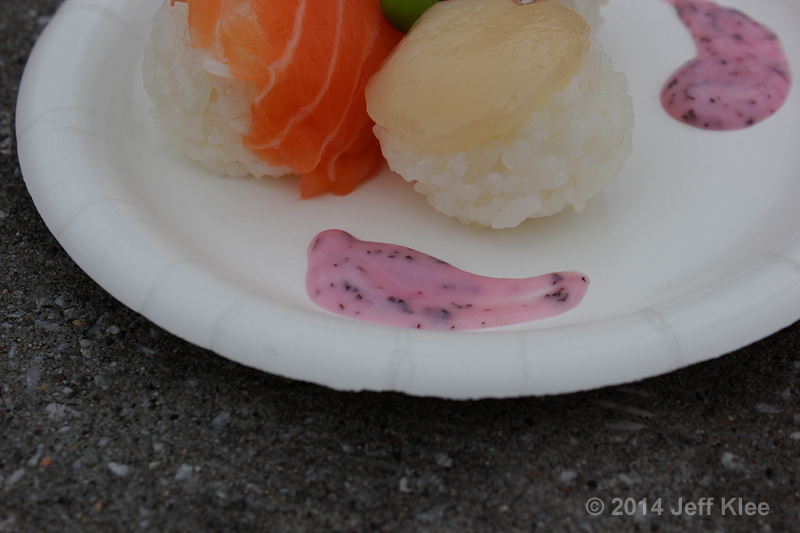 The salt was a great addition to the raw fish and sweeter aoili-looking cream sauce inside. I really enjoy tatares, and this was no exception. 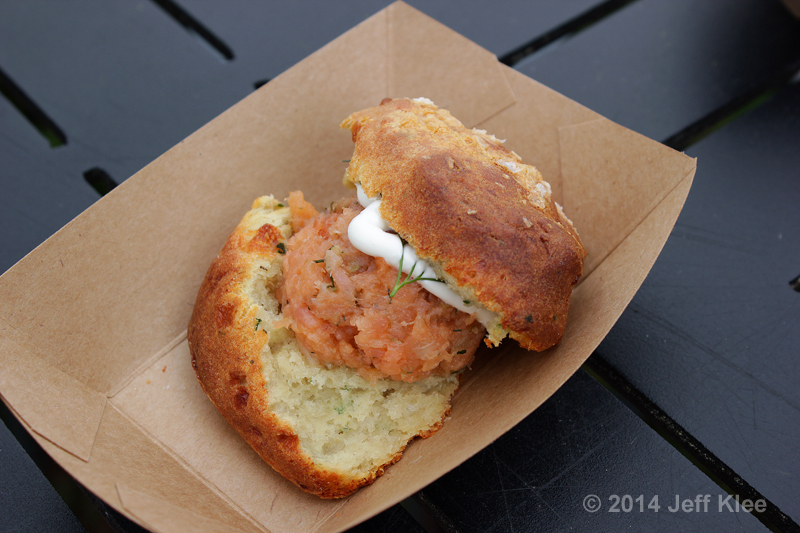 The raw salmon had a light fish taste that didn’t overwhelm the flavors from the bun. There was a lot of dill in the salmon. Those two ingredients always go hand in hand and are the perfect match. 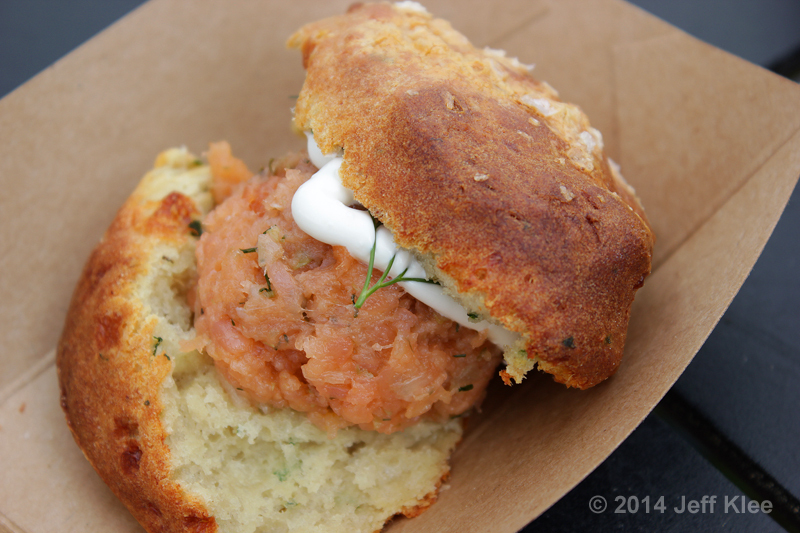 The dill not only adds to the salmon’s taste, but the bun as well. 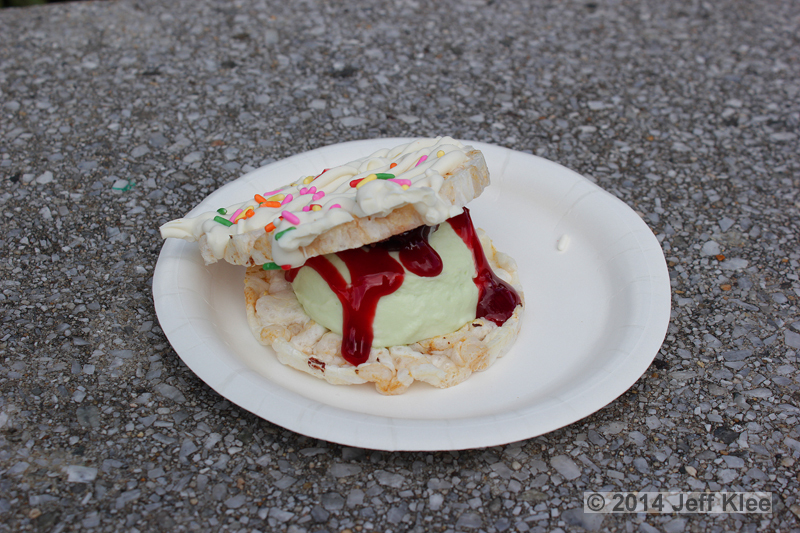 This was the one food item from the entire festival that my wife and I talked about before arriving for the week. We remembered it from last year, and looked forward to enjoying it again. Lucky for me, she stuck with her gluten-free diet, and I had it all to myself. The salad was well drenched in a dressing, but it wasn’t overdone. The dressing had less of a vinegar and more of a strong olive oil taste. The almonds seemed limited, and I barely got a taste of them. 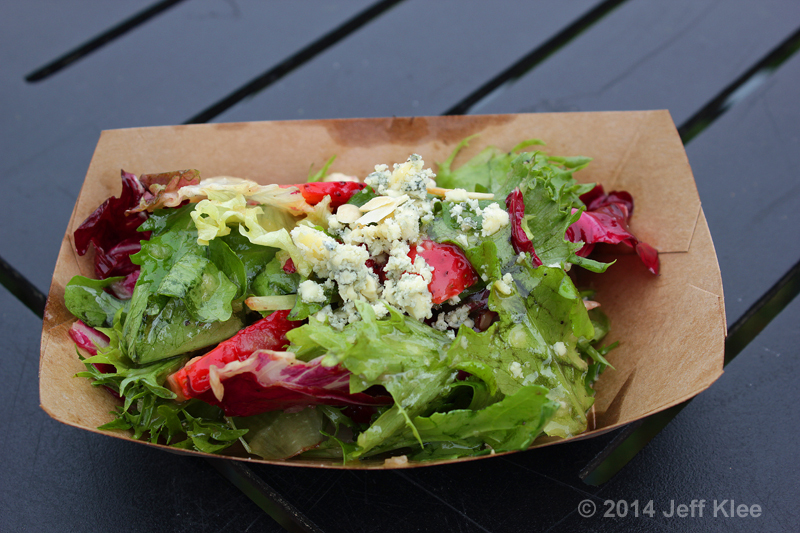 I often put strawberries on my own salads, so I’m no stranger to the fantastic taste they add to the greens. 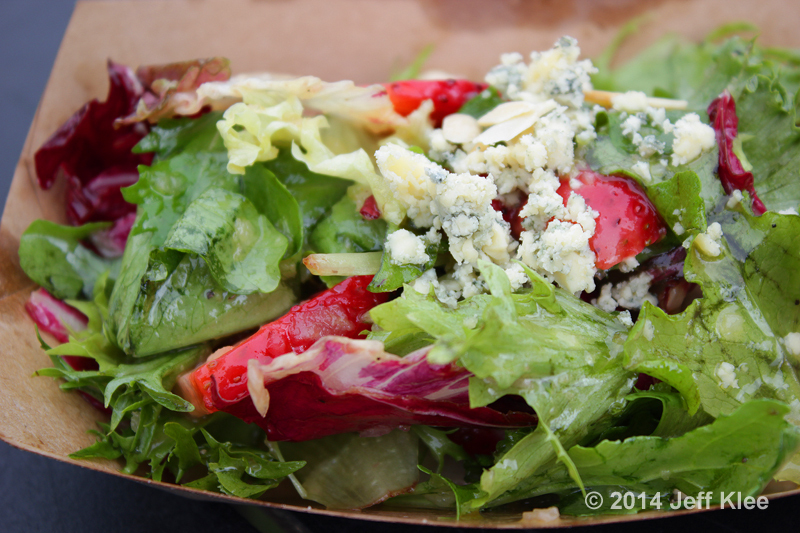 Another common ingredient on my personal salads, I loved the sharp taste offered by the Stilton, which is an English version of blue cheese. This salad was fairly simple, but had some very complimenting ingredients that provided a light, but tasteful snack. 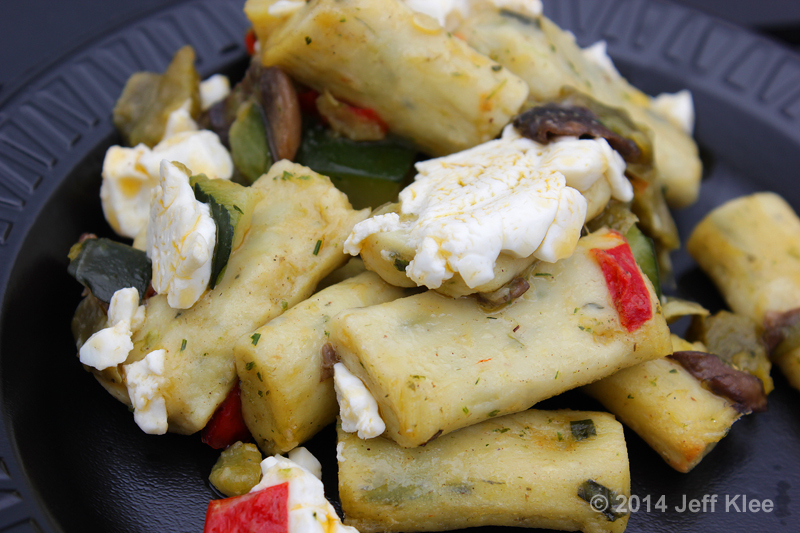 Parisian style gnocchi is not made from potatoes like they often are in The States. 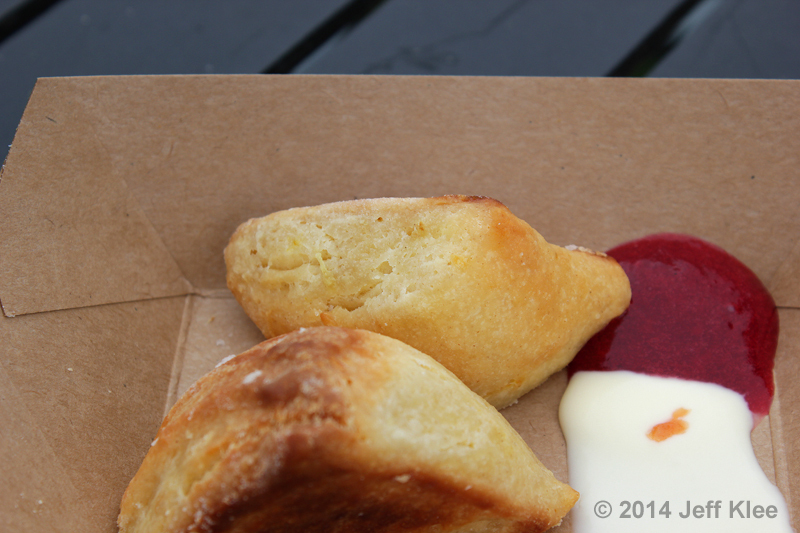 These are made from the very same dough that’s also used to make cream puffs. This made the gnocchi a little less dense than the typical American versions that use potato or vegetable for the dough, but I found it to be barely noticeable. The dish is served warm, and it had a very strong vegetable taste from the peppers and mushrooms. The peppers especially stood out from the other tastes. If it weren’t for the goat’s cheese, which also had a standout flavor, I would probably have disliked the dish even more. It just had a very greasy and mushy texture, and the cooked peppers were a bit too prominent for my tastes. Add to the fact that I generally dislike mushrooms, and this just wasn’t for me. Then I moved on to the Duck Confit. Officially listed as Confit de Canard, Pommes de Terre Sarladaise, or translated to pulled duck confit with garlic and parsley potatoes. It was an interesting meal. The most obvious thing I tasted was the duck. It was well cooked and very tender. 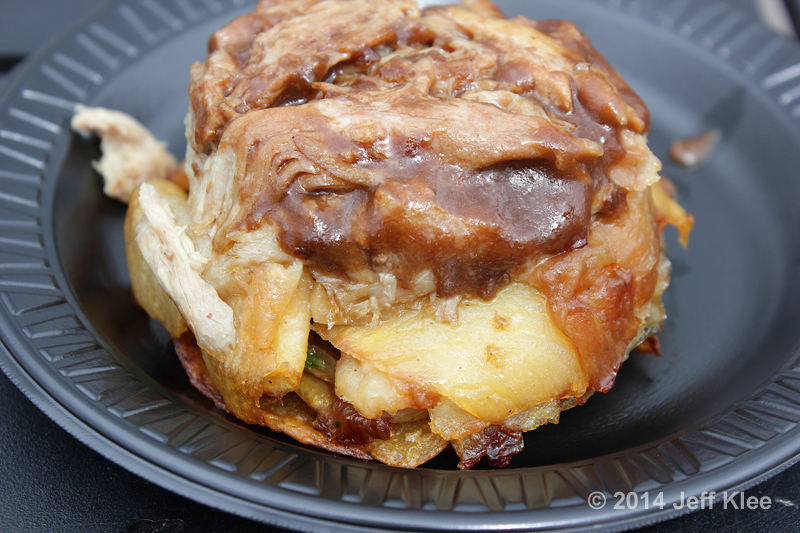 It was coated in a gravy that was a little lacking and didn’t seem to add much flavor to the other three ingredients. Duck is a fatty meat, and the empty plate had a layer of liquid fat leftover when I was done. I was now realizing how heavy this meal had been, and it was somewhat satiating. This was also the point I started noticing the garlic more; The taste was beginning to heighten as I finished eating everything. This was definitely more on the meal side of the spectrum. 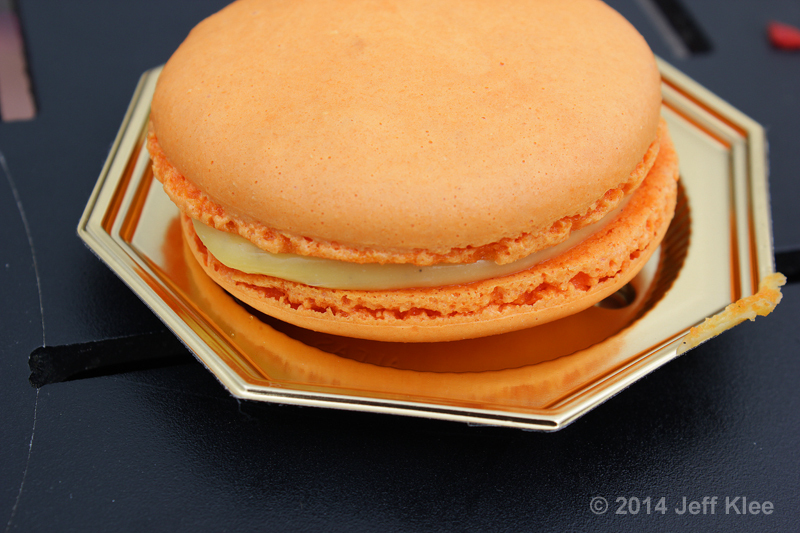 The last item was a Macaron à la Fleur d’Oranger, or Orange Blossom Macaron with white chocolate ganache. I gave the macaron to my wife to eat. 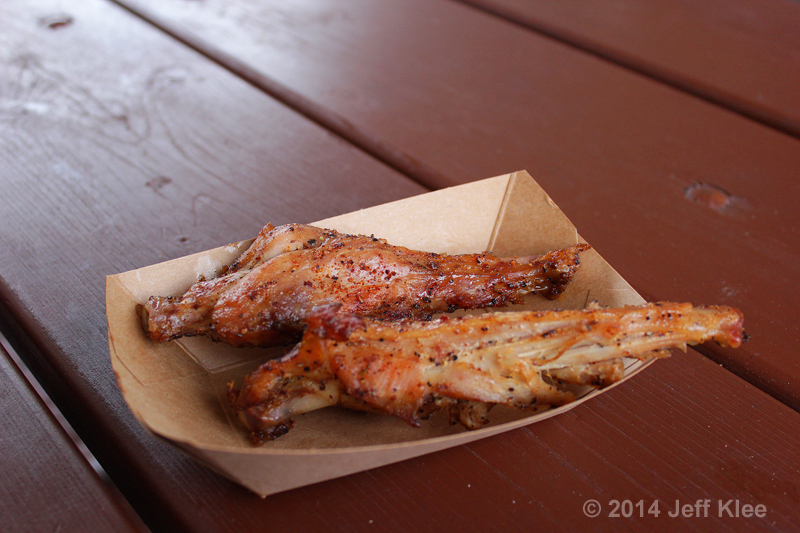 They are one of the many increasingly available gluten-free foods in Disney World. She has told me how many of the macarons found in Disney’s candy shops are very average at best. 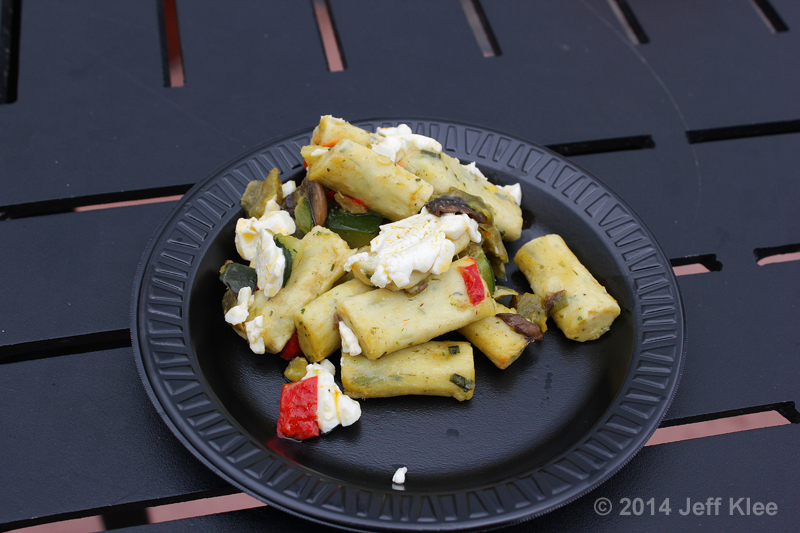 However, she finds that the ones in Epcot, and especially at the France pavilion, have much better textures and are more flavorful. 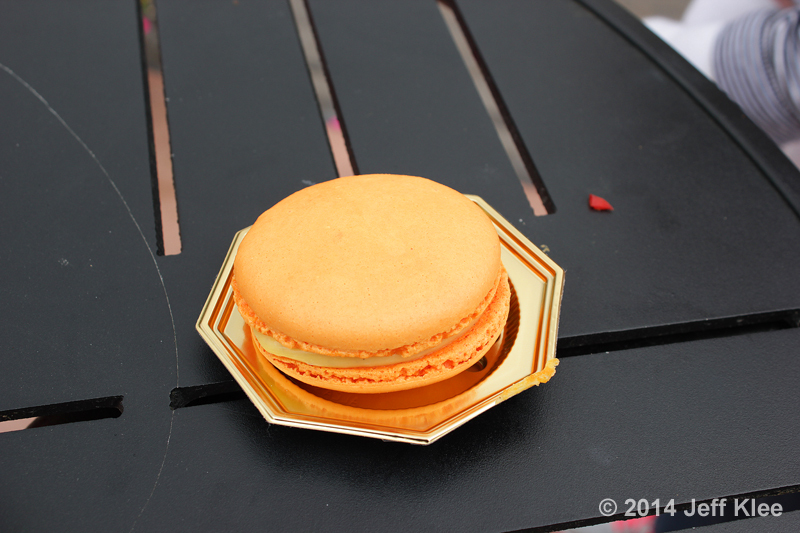 Apparently the macarons in Epcot use vanilla beans to enhance the flavor, and this one in particular was infused with an orange essence that she says was fantastic. We talked about going back later in the day to pick up another one or two for us to eat again, but never made it back around. From the way she spoke of it over the next couple weeks, I regretted not trying it. From France we took a short stroll to Morocco for another three snacks. 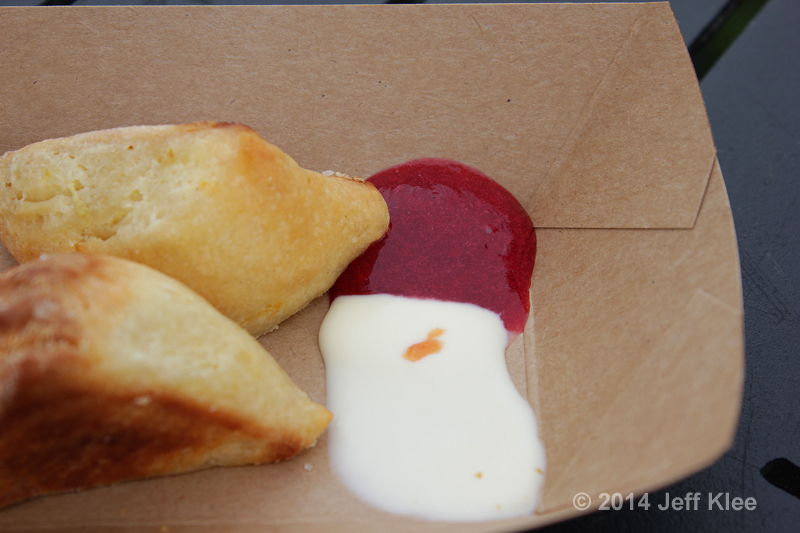 Morocco’s kiosk, Taste of Marrakesh had two repeats from last year, but in the name of research I tried them again for quality control testing. 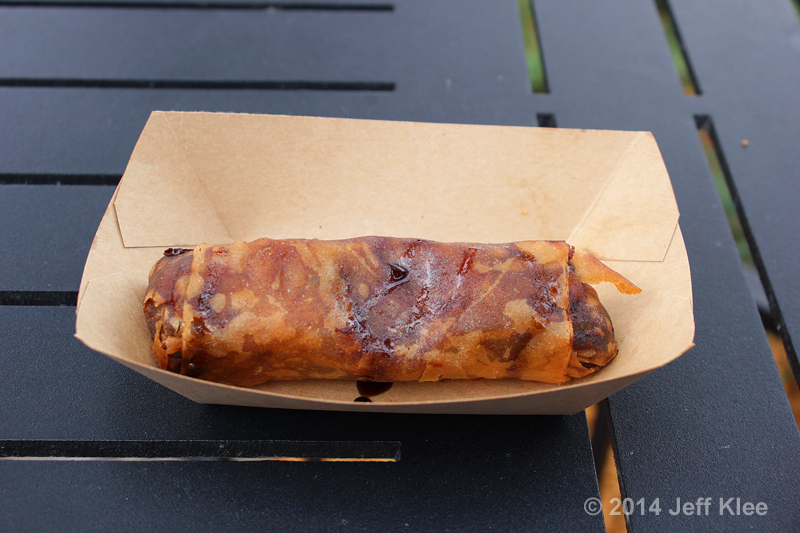 The one new item was the Lamb Brewat Roll with Prunes and Sesame. I had one of these brewat rolls on my last visit to Restaurant Marrakesh, and enjoyed the appetizer during that meal. This one had a few alterations. The biggest change was the addition of the prunes. 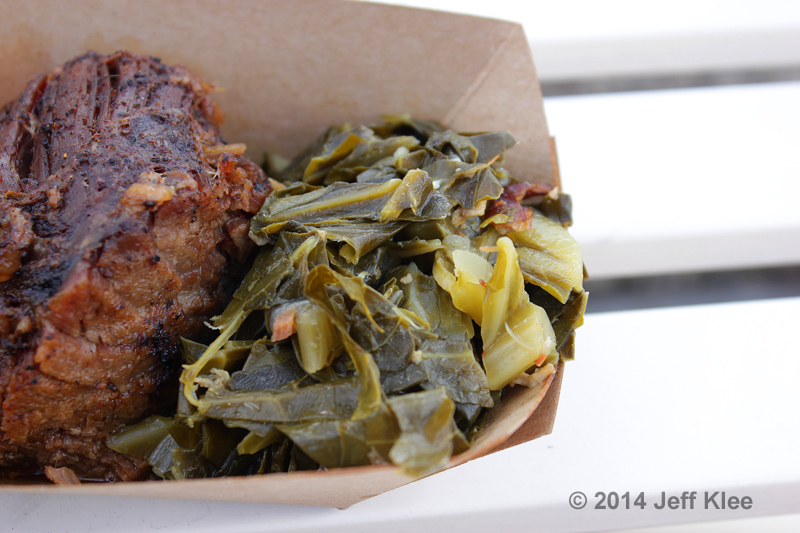 When I got a taste of the prunes, it provided a great sweetness that I thought went very well with the lamb. 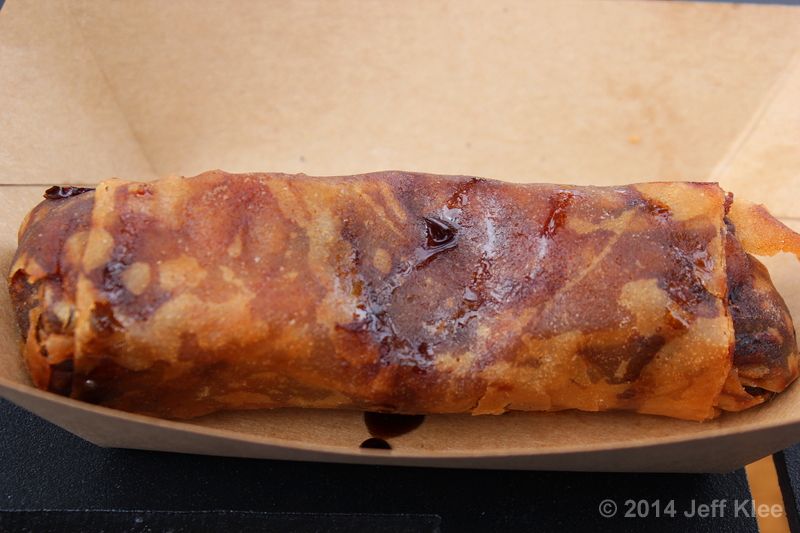 When the roll was served to me at the counter, they used a condiment bottle to drizzle what I believe must have been some sort of prune reduction sauce over the outside. It was dark in color and also very sweet like the prunes. I really liked the flavor that the sweet prunes and sauce brought to the dish. The lamb was cooked to perfection. It was in a shredded form, but it was very moist, almost greasy from being deep fried. I remember the ones I had dining in the restaurant seemed much drier than this, and I didn’t find them as appetizing. I never could taste any sesame, although it may have been sesame oil that it was partially cooked in. Either way, there was no loss from not tasting this last ingredient. I enjoyed every bite. 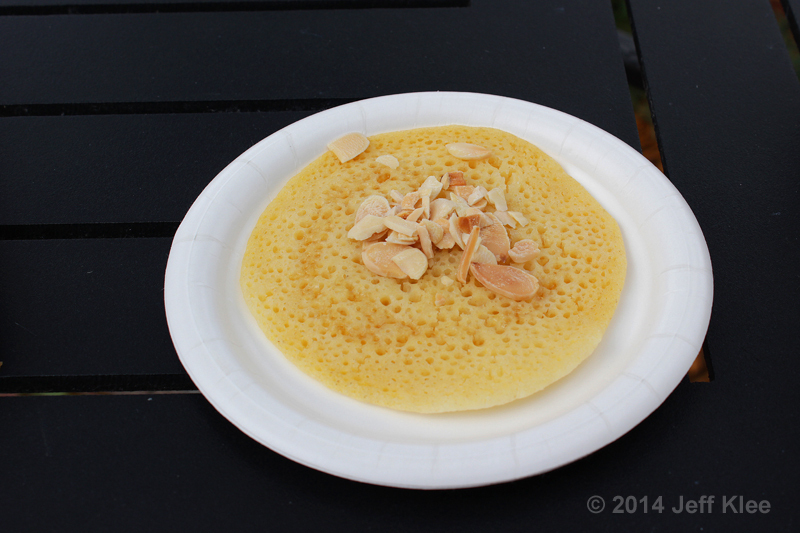 The Baghrir, or Moroccan Pancake with Honey, Almonds, and Argan Oil, was a repeat from last year. Argan oil is simply an oil that comes from the argan tree, which is native to Morocco. I clearly remembered this honey soaked pancake as soon as I saw it on the menu. It was actually a fairly self-explanatory taste. A pancake that tasted mostly of honey. 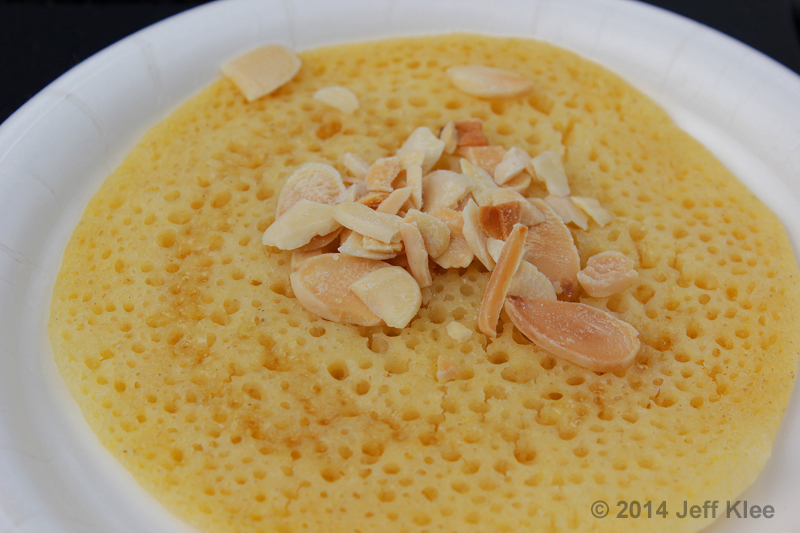 In this case, the almonds were sufficient enough to easily add their flavor. Be aware if you plan on giving it a try, this pancake has enough honey and oil that it literally could be wrung out. 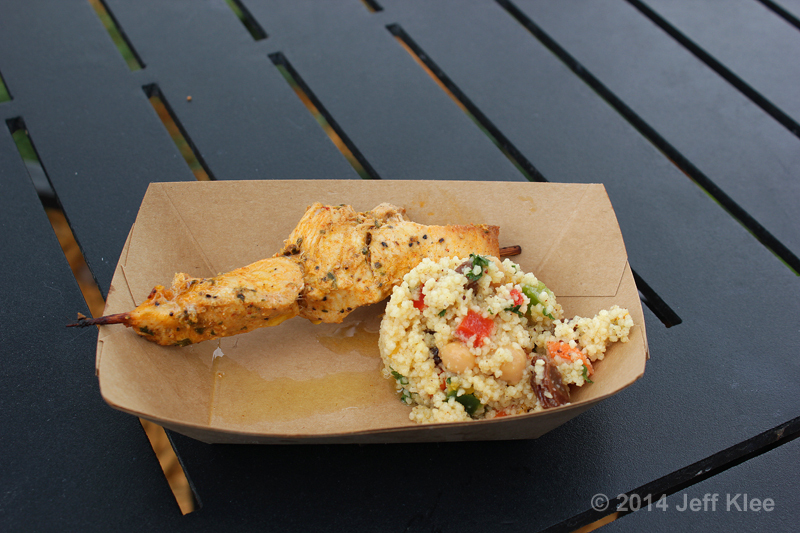 The other repeat that I remembered well from last year wast the Harissa Chicken Kebob with Couscous Salad. The couscous had a lot of ingredients. The ones I could easily identify would be raisins, carrots, chic peas, bell peppers, and some type of leafy herb, possibly parsley. I liked the sweetness that the raisins gave the overall taste. The bell peppers also added some of the same. This plate also had some kind of sauce that they drizzled from a condiment bottle, but I never found out what it was. This was a tasty side item. 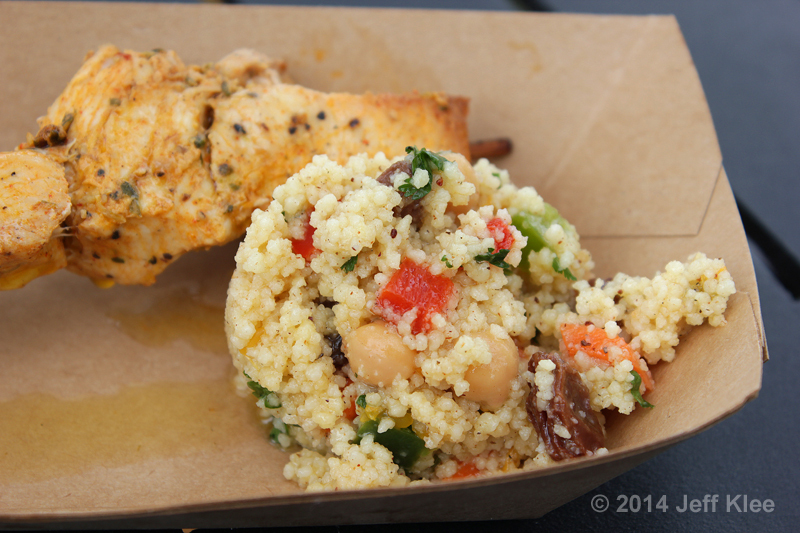 They have a few variations of couscous in the Morocco pavilion, and while I don’t love them, I don’t dislike then either. This one had a lot of flavors mixed in, making it a bit more interesting. 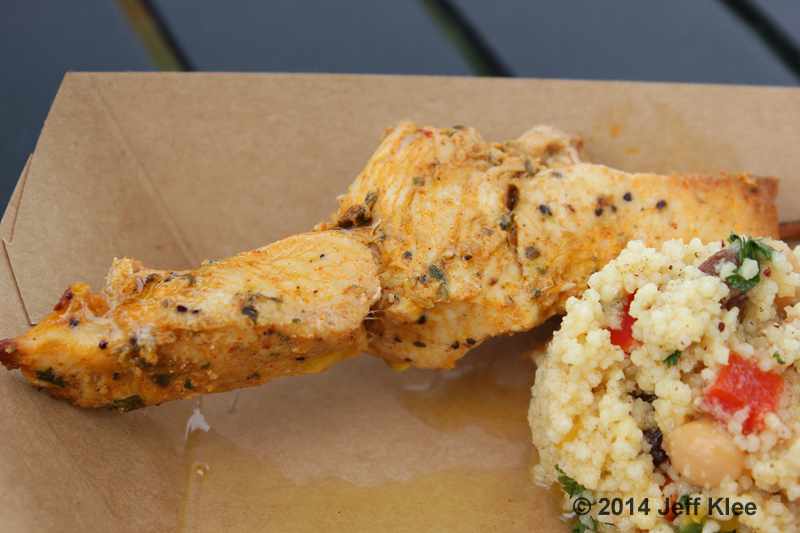 The chicken kabob was flavored with curry, which you have probably figured out by now is not a favorite of mine. Fortunately, it wasn’t too strong of a curry flavor and it only had a slight spicy kick that I was able to handle. It was enough that I noticed it though. The chicken was slightly dry. This also didn’t help me enjoy the meal as much. Overall, the plate had some decent food, but it didn’t wow me as much as this region’s food has in recent times. Our next pavilion was China, where the Hanami booth was located. 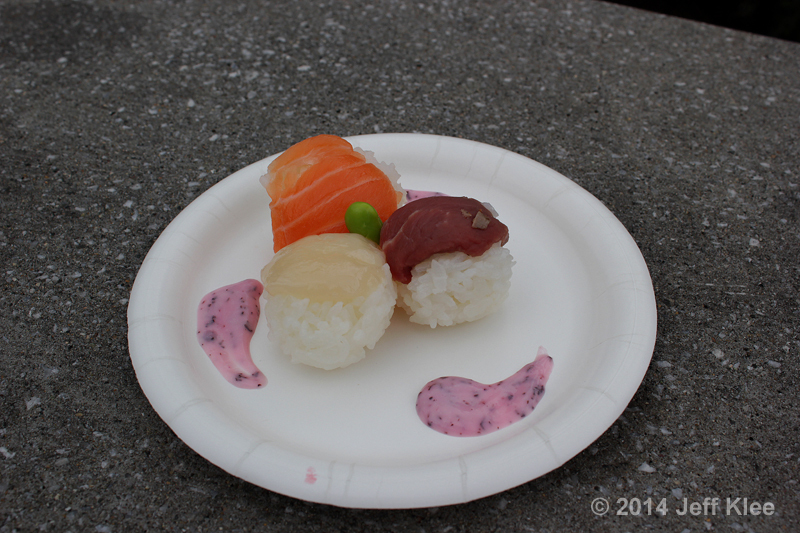 A favorite of many Disney fans last year, their signature Frushi made a return for 2014. 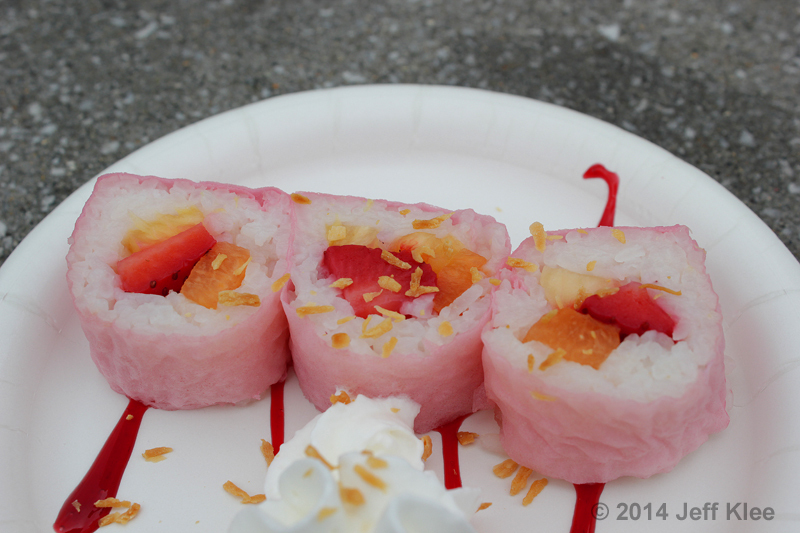 The menu described it as “pineapple, strawberries, and melon rolled with coconut rice, served with raspberry sauce, sprinkled with toasted coconut and whipped cream” on the side. This was exactly the same that was offered last year. The only difference was last year’s seaweed was green, and this year it was pink. 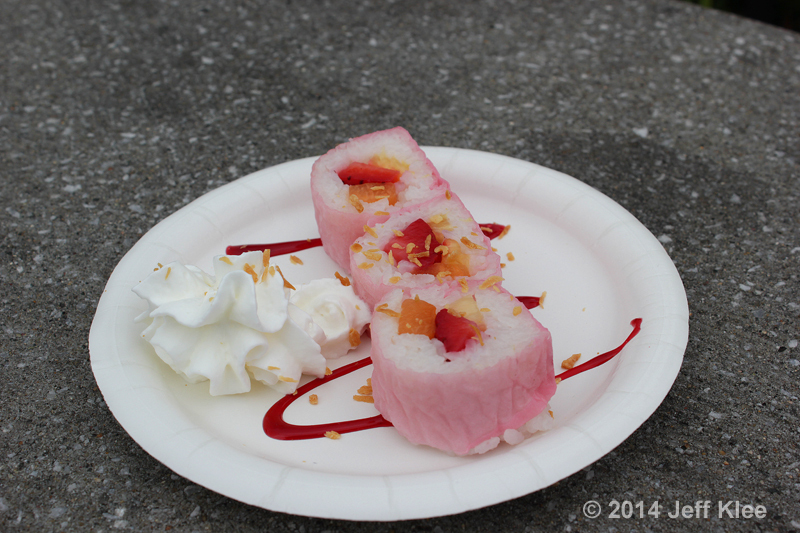 As before, they used real whipped cream, and included a drizzle of raspberry sauce that gave an additional fruity flavor to this “sushi.” Because of the sushi rice, I felt it had a sort of a chewy fruit salad taste. It was good, but nothing overly exciting considering the other options available throughout the festival. 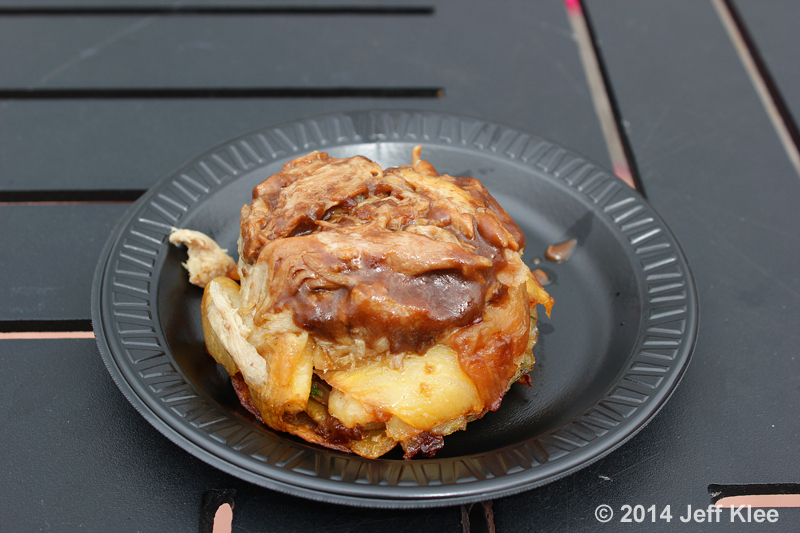 The next food item was new this year. I have limited experience eating sushi, but the sushi rice that formed both these snacks and the above Frushi seemed extra sticky. This once again created a more chewy bite, which made for an interesting texture. They held together really well considering there was no wrapping on the outside. 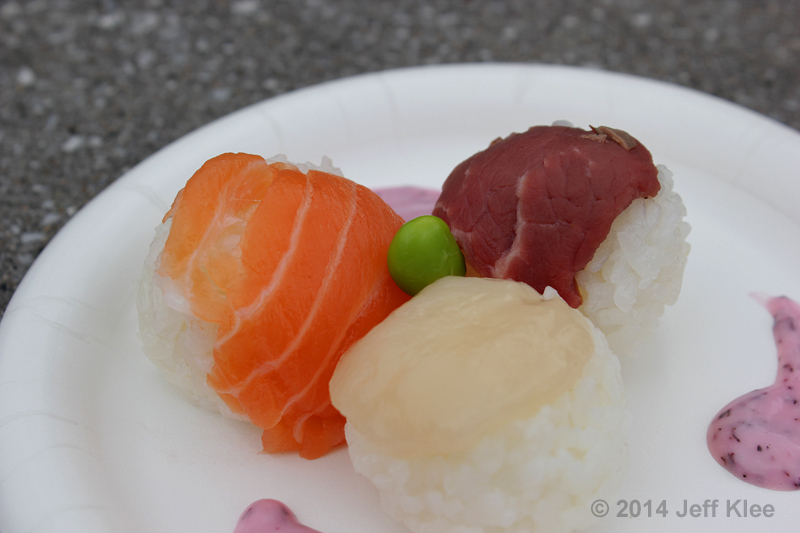 The proteins draped over the top of the rice balls were delicious. I’d never had raw scallop, and found it had a prominent fishy taste, but still tasty. Salmon and beef I’m familiar with in their raw forms, and both were exactly as I was expecting. The Shiso Violet Sauce was a real head scratcher for me. I just couldn’t pinpoint the taste that it put out. Shiso is an herb from the mint family used in various Japanese dishes, but my research found no mention of it being used for any kind of sauce. It didn’t have a minty flavor, so it most likely was used for seasoning rather than the base of the sauce. What I can tell you is that it was very sweet. It also had a slight fishy taste, so I was thinking it could have fish sauce in it as well. 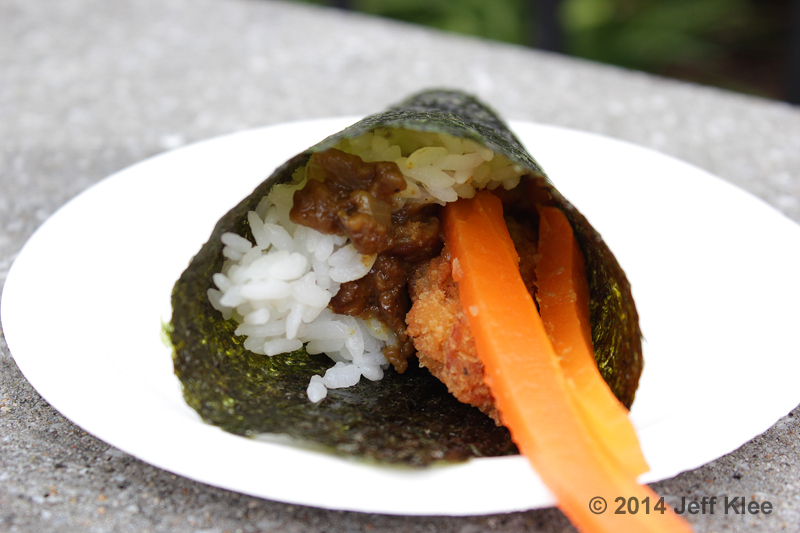 All in all it worked amazingly well with the rice balls. They figured the perfect flavor to go with the rice and protein to create a mouth-watering combination that left me surprised and wanting more. The first thing I noticed was the strong taste of curry. This time it was a little too much for my preference. It was probably the only downside to the roll. The chicken had a really thick layer of the panko breading, and it was fried to a high crisp. The rice was again the same very sticky sushi rice as the others. The carrots were cooked through and very soft. 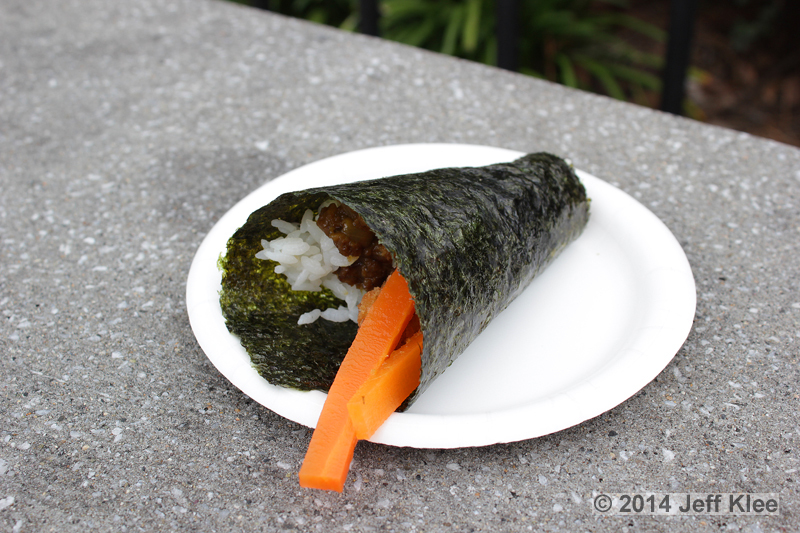 The nori (seaweed) roll was a nice touch, as this meal could be eaten on the go without dirtying your hands. Despite the curry, I still liked it. The chicken’s texture really made up for the flavor of curry. It was the old guarantee of mixing crunchy with soft and chewy. 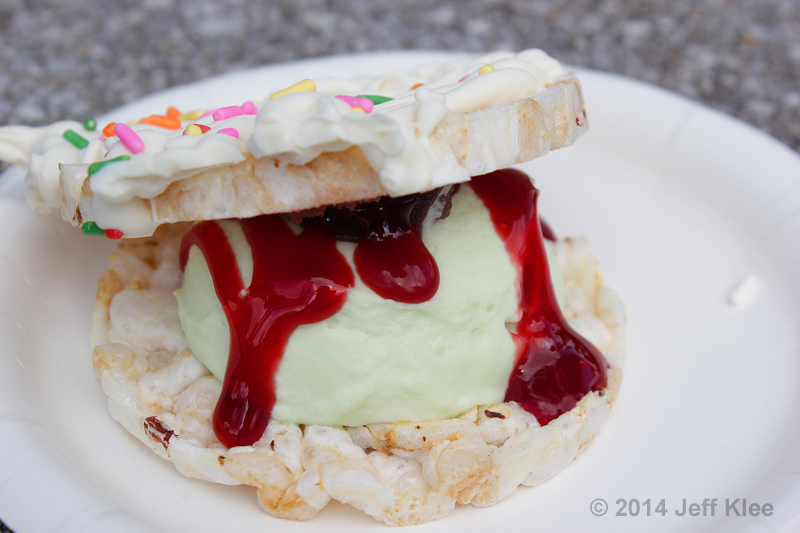 You sandwich them around flavored whipped cream and then drizzle them with various other sugary concoctions! 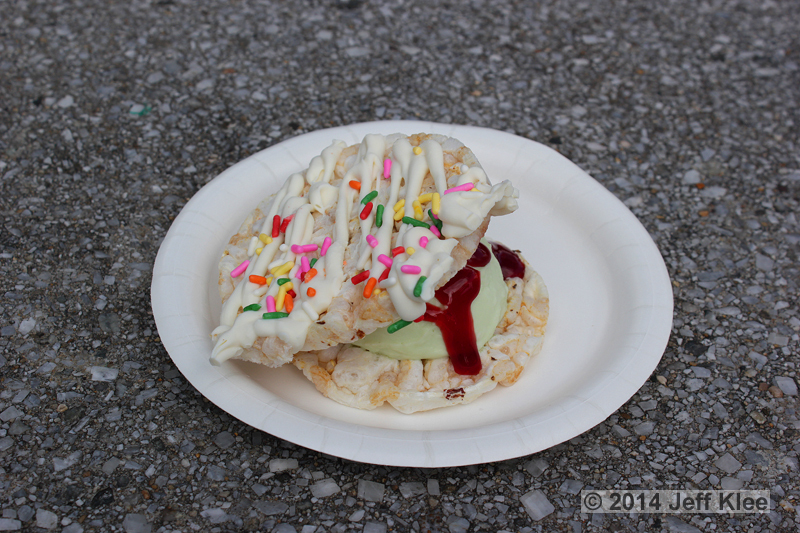 In between the two rice cakes was a thick slab of sweet green tea whipped cream. The whipped cream seemed just a tad firmer than normal, so it might have had an additive to thicken it. This was good since it kept the product from completely squirting out the sides when you pressed the rice cakes together for a bite. 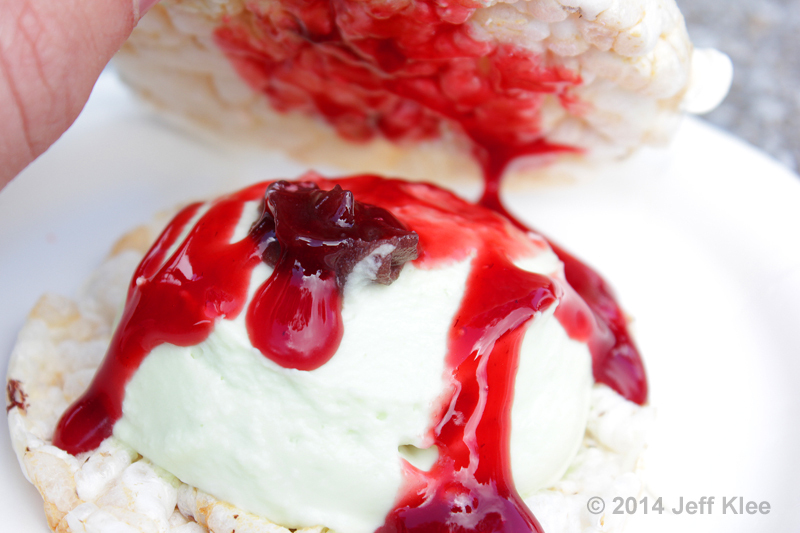 On top of the green tea whipped cream, which was very well sweetened by the way, was a drizzle of azuki sauce. Azuki is a Japanese bean that is often used as a filling in their desserts. The beans are boiled with sugar, which results in a sweet red paste. Besides the liquid drizzle, there appeared to be a soft azuki bean actually placed at the top of the whipped cream. If that wasn’t enough, they then coated the rice cakes with a cookie icing. This is the type of glaze that hardens after sitting. 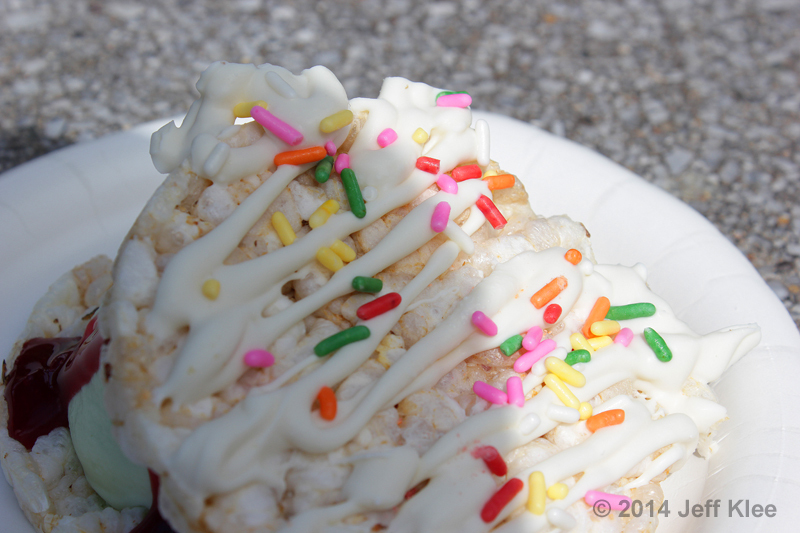 So now even the boring part (the rice cake) was mostly covered in a sugary coating, and they still go one step further and top them with sprinkles. The whole dessert was very sweet, with a multitude of different flavors. I was really surprised to enjoy it as much as I did. Leave to the Japanese to take our most boring food and perk it up enough for even this die-hard dessert fan to like. 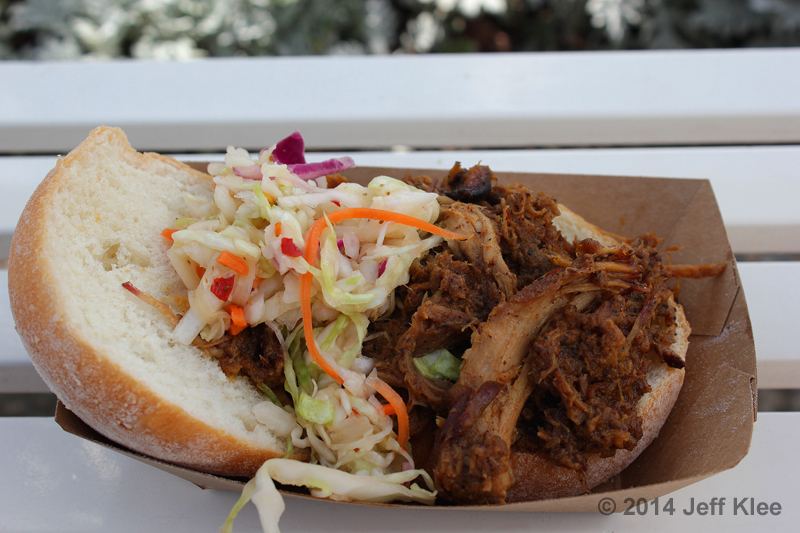 One disappointment I had last year when making my rounds through the Flower & Garden Festival, was that I visited the American pavilion’s kiosk, The Smokehouse: Barbecue and Brews, at the end of my run. 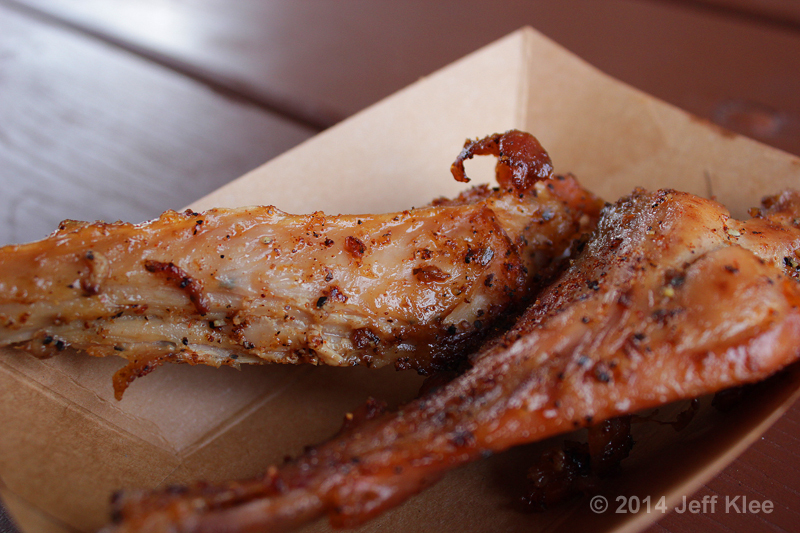 It tends to be one of the favorites among Disney foodies (we live in America after all, and we love our barbecue). My wife agreed that it had some of the better dishes we tried, but I was so full by that point that I wasn’t able to enjoy it as much as I should have. This year, it was going to be my sixth stop out of eleven kiosks I would be visiting, and since I was not yet full I would hopefully have the chance to really enjoy it. 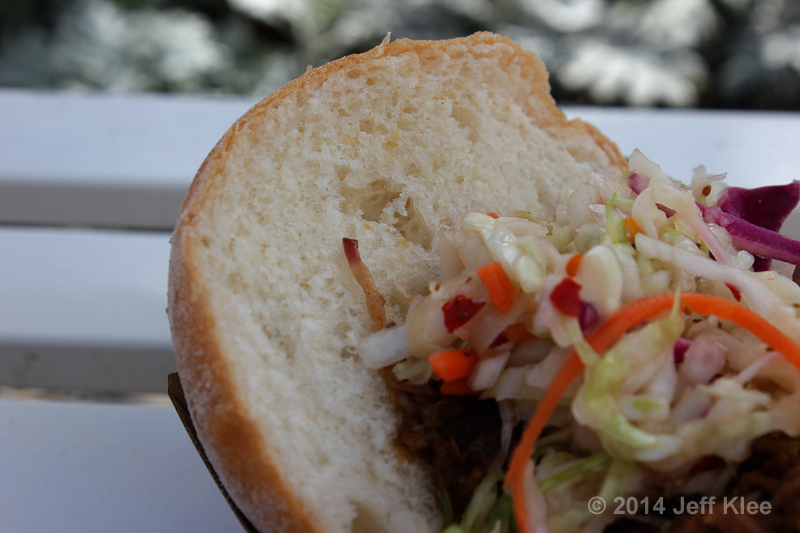 My first taste was the Pulled Pig Slider with Cole Slaw. The pork had a good barbecue taste. I found the meat to be ridiculously tender. It fell apart with the slightest touch. It also had a taste of chili that I noticed, especially in the juices. I don’t know if it was due to an added dressing, but the slaw had quite a bit of liquid. It kept the sandwich very moist. 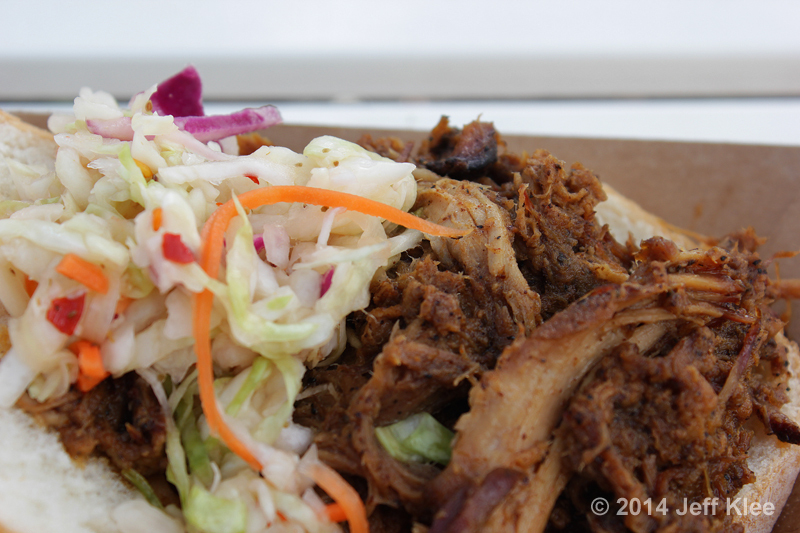 The slaw was moderately sweet, which complimented the barbecued meat, while at the same time the vegetable’s crunch contrasted the soft pork’s texture. The bun was also soft, and parts of it were soaked from the slaw liquid that sat in the bottom, causing some mushy parts. One thing that was obvious about the whole sandwich was the saltiness. The slaw helped neutralize that a little, but I could see why I wasn’t too thrilled last year after eating over 30 meals and then having to eat a lot of salty meat and bread. This year it was more enjoyable since I positioned the stop at the half way point. 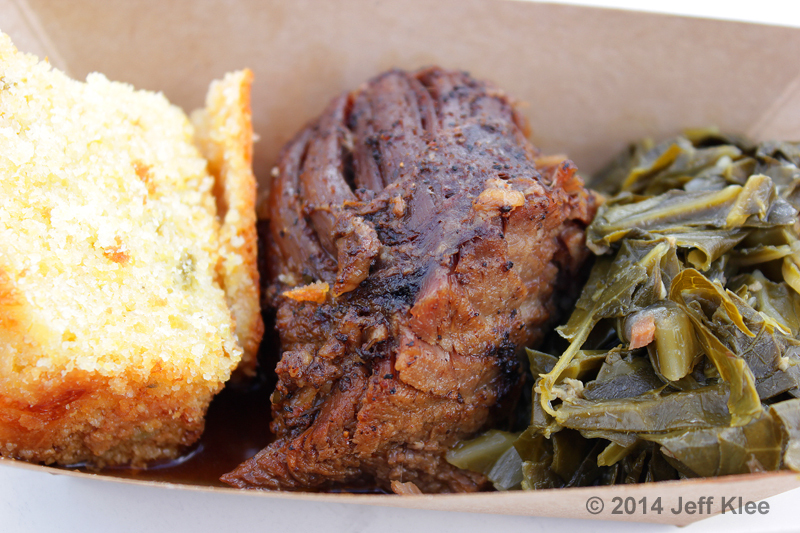 After the pig slider I dug into the Smoked Beef Brisket with Collard Greens and Jalapeño Corn Bread. I began with the greens, which had an nice bright texture (usually a good sign). They were half cooked, making them not too soft and not too crunchy. They had a hardy taste of green vegetables, indicating their freshness. It was clear these hadn’t sat around under a heat lamp or been cooked too long. 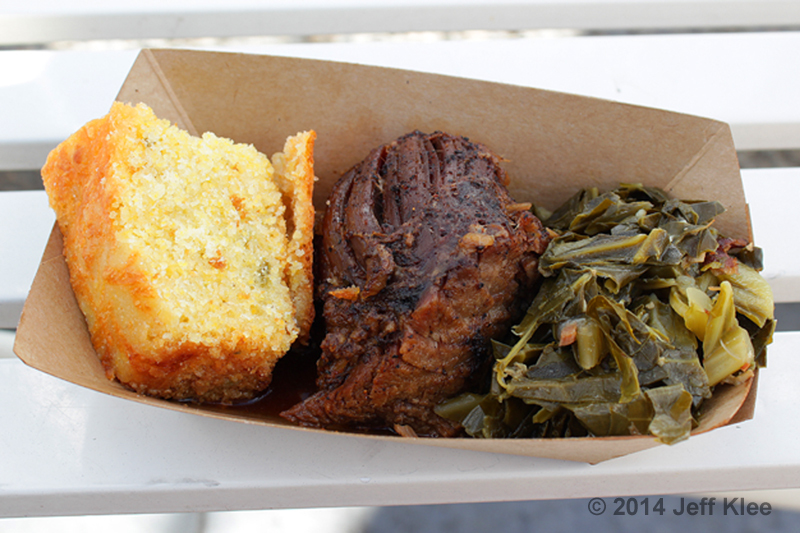 The brisket was well braised, making it soft and juicy. It held together well, but if real metal utensils were used it could probably be cut with a fork. It too had a nice barbecue flavor that saturated the entire cut. 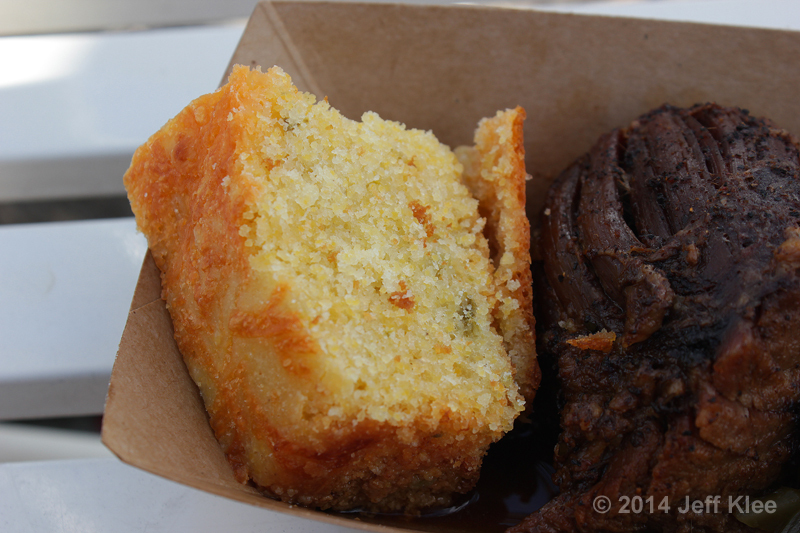 I was most nervous about the corn bread because of the jalapeño. It turned out that it wasn’t spicy at all. I still didn’t think the flavor was great, probably due to jalapeños blended into the bread. After swallowing a bite, I did finally notice a hint of spice, but it was well within my comfort zone. The corn bread was very moist and needed no water to chase it. That’s always a plus since corn bread can very easily, and often does come out dry. I didn’t love it, but it was good. My wife really enjoyed it. Partly because she found it tasty, but also because she was able to eat a piece of bread that was gluten-free. 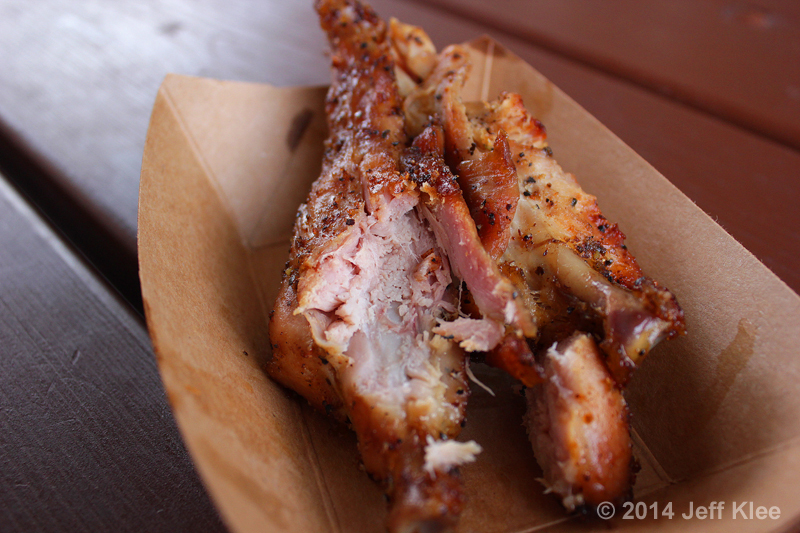 The last “meal” before dessert was the Smoked Turkey Rib. The turkey was definitely flavorful. I most notably could sense the pepper that dusted the exterior. I did find it was almost on the dry side, but not quite all the way there. 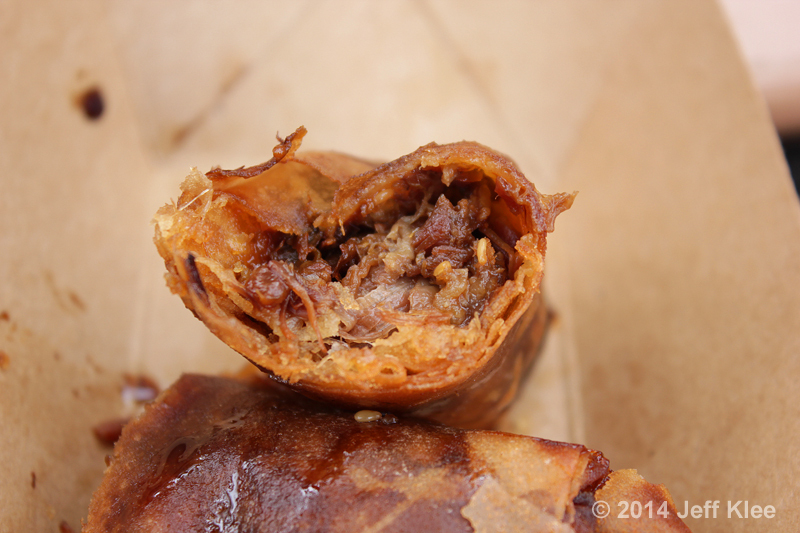 Inside, it had a really decent smokey flavor that penetrated all the way through. It was good, but over all it was just turkey with some seasoning. However, if you’re looking for that thorough barbecue taste, it’s certainly there. 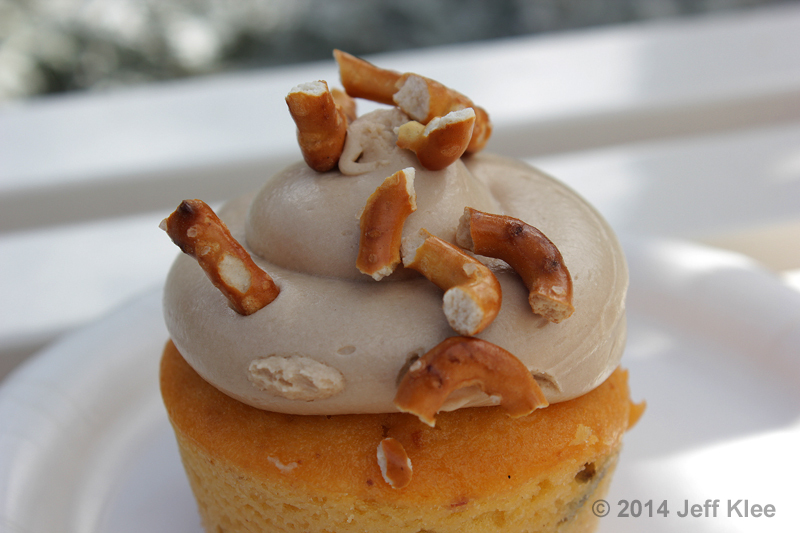 This is the “Piggylicious” Bacon Cupcake with Maple Frosting and Pretzel Crunch. The base looked like it was made from corn bread. It wasn’t though, it was a standard vanilla cupcake base. Well, standard until you find the little brown bits mixed inside. That would be the Nueske’s® brand applewood smoked bacon. The bacon gave just a hint of saltiness that, as expected, contrasted nicely with the sweet vanilla cupcake. 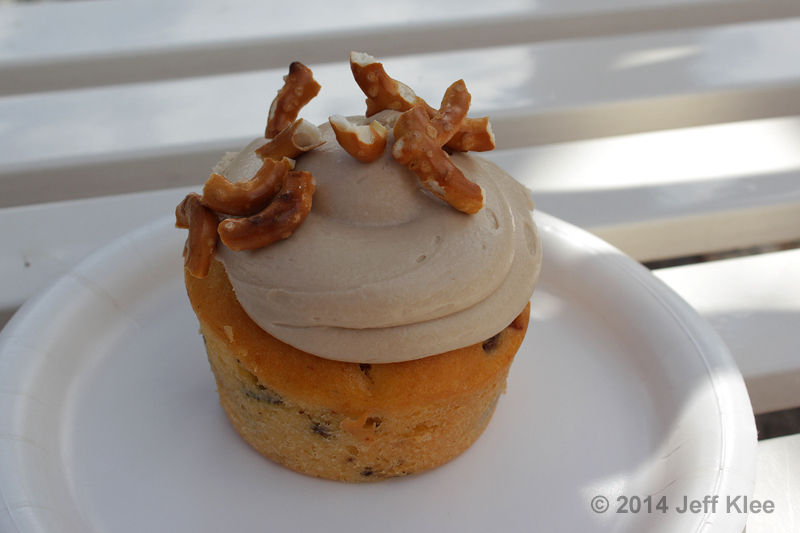 Still, this was a very unusual flavor combination for a cupcake. Vanilla and bacon are not two flavors you normally see together, especially in a dessert. Incredible! The thick butter cream topping had a strong maple flavor. 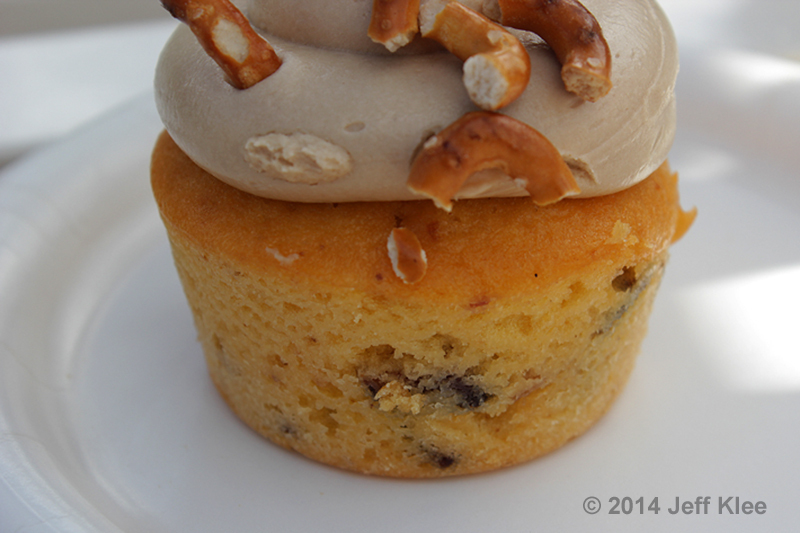 Sharing the sweet space on top of the mini-cake was the saltiness and crunch of the scattered pretzel bits. This frosting really wowed me. There were some excellent flavors together in this small space. I may not have been too terribly impressed with the other items at this kiosk, but this cupcake was worth the stop. I would have loved for the bacon in the cupcake to be more prominent, maybe with an increased quantity, as I may not have realized it was bacon had I not read it. Otherwise, this was a unique concept that for the most part was executed well. At this time I decided to take a short break and walk the park while letting the first round settle. It had taken me almost three hours so far, but I’d covered about half of the outdoor kitchens, and sampled eighteen different dishes from five countries. For those interested in international cuisine, this is such a magnificent way to do it all in one stop. While much of the food so far has ranged between average and slightly above, I don’t need to be amazed by everything I try. I’m just happy to be able to sample what some people eat every day in their lives and get a feel (or taste) for their culture. The bonus is that when I need a break from eating, there are dozens of shops, rides, and other entertainment just a short walking distance away. Oh yeah, and more restaurants also. Next post I will feature the second half of the outdoor kitchens from this year.